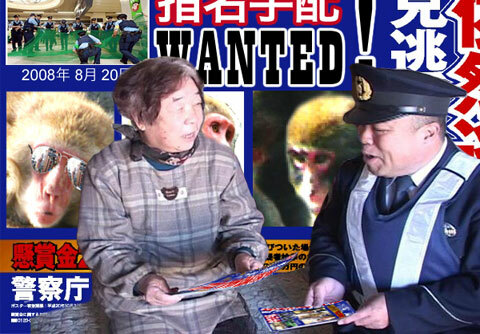 The infamous wild monkey of Tokyo continues to elude captors. The macaque monkey that stormed Shibuya train station in August 2008 is apparently living in an internet cafe. Frustrated authorities have requested assistance from experts in primatology and the government’s spy agency. An expert claims the monkey has developed a phobia. Meanwhile, the monkey posts Twitter updates and eats a lot of instant ramen. Click here to read the update about the Tokyo Shibuya monkey.